I love color in a home, but I also love rooms filled with white when the white is done right. To make a white room not come across as cold and sterile it needs texture and some kind of other color besides white. That other color can even be a neutral. With the summer heat upon us already I'm loving white for a cooler feel. Enjoy the examples below. 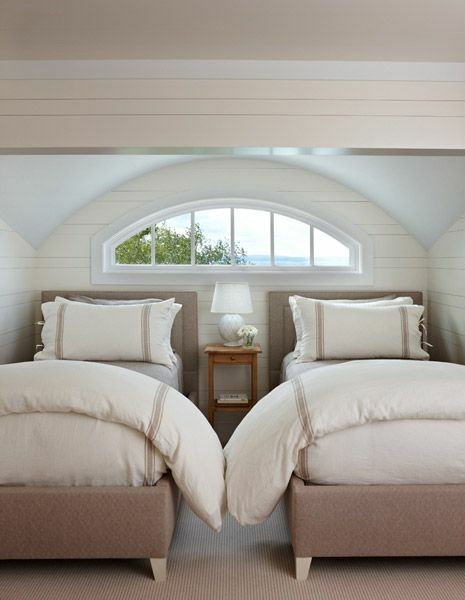 Slipcovers, nubby texture in the fabric and touches of wood are perfect in this beach cottage. Same beach cottage. What a cute room with planked walls and that eyebrow window. 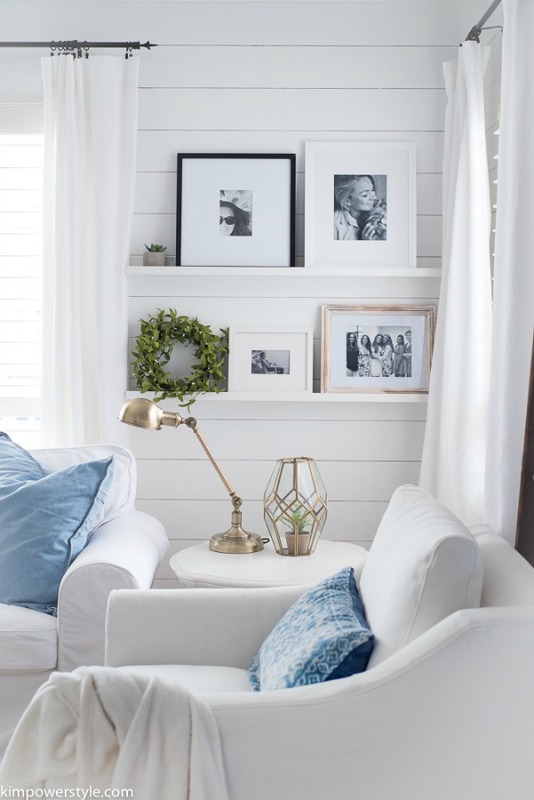 Shiplap, shelving, picture frames and touches of blue are just right by Kim Power Style. This is her new office. I wouldn't mind working in there. Beautiful southeaster designer showhouse tour shared here. The honey brown table, baskets, and those beams add warmth. 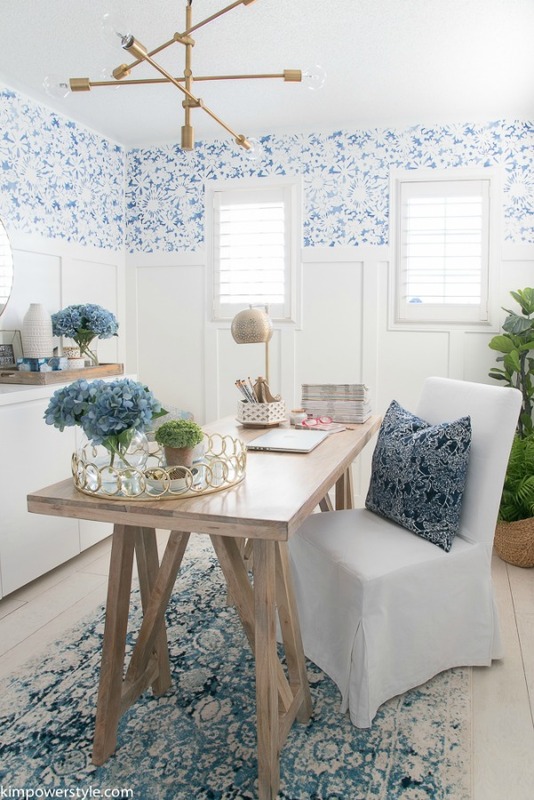 This room was found on pinterest, but the link does't go to the original source. This room has lots of texture. Even the cute pup adds texture. Gosh, I love those beams. 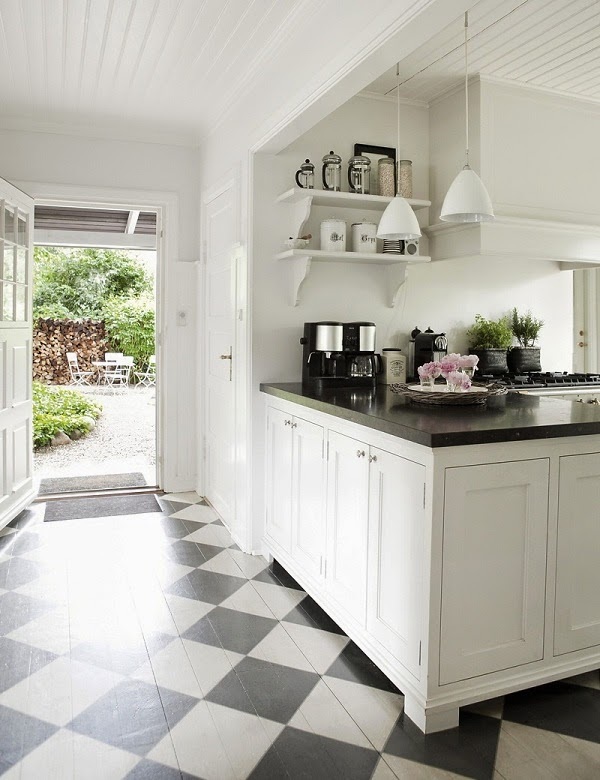 Love the kitchen with the painted black and white floor in the same house as above. Even my sister does white just right. All pretty. I do love my color though I can appreciate all of the rooms you showed us. Your sister does a great job with different shades and textures. Love those beams too...I think I have seen that image that you cannot find the source on, in a magazine....love Kelly's room! Kim, we live with lots of color in details, but our walls are mostly neutrals. I like the serene feeling of these rooms, but I don't like a totally neutral feel for an entire home unless it's at the beach. Beautiful examples here! My favorite is the beach cottage with the eyebrow window. Being an artist, white is my friend. 😀The best for showcasing all the colour and texture I put in a piece. But yes, white done right is beautiful indeed!! During the summer, I to tend to lean toward a paler palette. 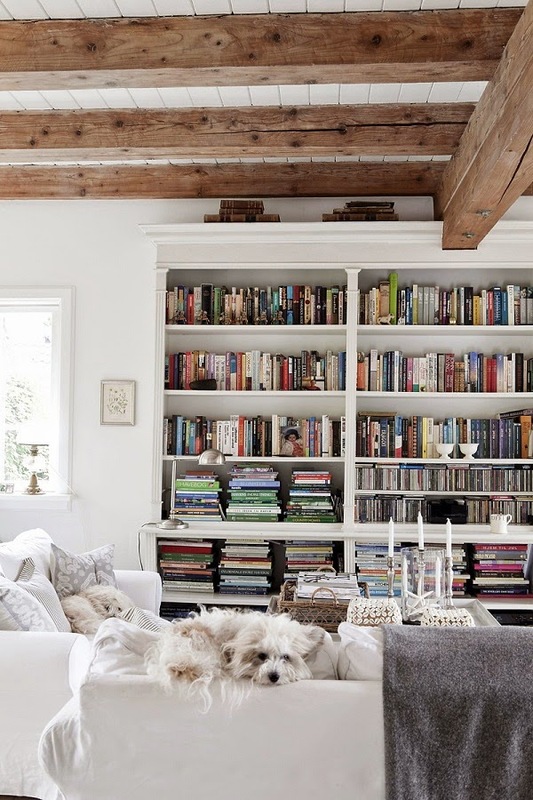 I'm drooling over the beams, bookcases, black and white floor, and most of all that dog in the home above. I really want to go white, but so many whites out there it's overwhelming. Thanks for the inspiration. White is so refreshing and I always enjoy noticing how people use it. As much as I admire it, I'm afraid I'm a color gal. BTW, how is your ankle coming along? I know what it's like to be incapacitated! That image is from the home decorating guru website, although I did not go through the images to find that particular one. Love neutrals and our home has almost always had a white (actually more of a creamy off-white) backdrop. Upholstered furniture is all light/neutral as well as bedding. Soft color is added in accessories. 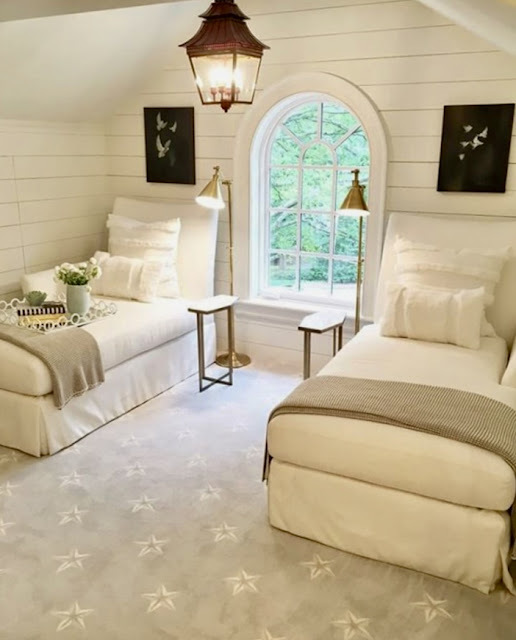 Now, thanks to these pics, I want a planked ceiling, paneled walls, beams, some great baskets to hang on a wall (I have been searching for those and love the ones on Kim's site), etc. I inherited my grandparents home, which I am renting out. Their den was kind of dark with all paneling in the room. I had the painter paint the paneling a creamy white and love it. Now I think about paneling a room! LOL Hubby would die! I just love the zen feeling I get in a white or off-white room. I also love color, but over-the-top color, which is hard to actually live with. So I seek it out in places like restaurants. When I look around our house, the furniture and walls are mostly plain white, but there are other colors--the oriental rugs, the red marble countertops, the terra cotta tile floors, the wood beams on the ceiling, the antiques. It's probably why it looked a lot better when we switched to white furniture, to calm things down. Slipcovers are the best thing for living with white furniture, as long as they are machine washable. As always, your photos are beautiful! 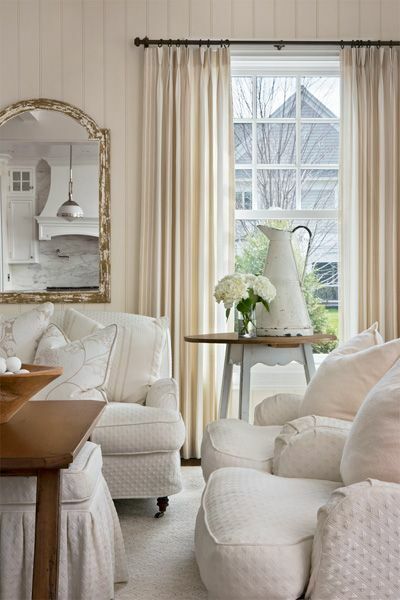 I love seeing white rooms in other people's houses, but I've never done it in my own. Maybe one day. Awwww........thanks for this shout out and sweet compliment! I just now saw this. I'm late to getting around to blogs today. We now live in a home with all white walls and moldings and it is by far my favorite to date. Always clean, airy, crisp and fresh. Love white delight!!! I love white! But as you suggest, it' difficult to decorate with it beautifully, those are perfect examples.